Decorate your home with DIY projects to get you into the Valentine’s Day spirit. Valentine’s Day is one of the best holidays to get crafty. Whether it’s making homemade cards for friends or making a box to hold all the cards in, Valentine’s Day is the perfect holiday for crafts. Using a crayon or marking pen and a yardstick, mark your fabric into a two 17×17 squares. After the squares are marked, cut out both squares utilizing a pair of sharp scissors. Once both squares are cut out, choose a square to place heart template. Utilizing the template mark out ever 1 ½” or 2” to pinpoint where you will be cutting slits for the Gimp. Cut out the slits on the fabric for your gimp. Apply fray check to the cut-off end on your gimp let dry for 15 mins. Once gimp is dry start threading your gimp through the slits. While threading the gimp allow some slack. Once gimp is threaded through slits, you should end up with both end meeting at the bottom of the heart shape. Tie both ends of gimp into a bow. Flip the square with the heart over and have it face the other square. Make sure to tuck in the bow, you do not want to sew into the bow ends. Using your quilting pins, pin together both faces in preparation for sewing pillow close. This is what your pillow should look like up to this point. Sew starting 2 inches from the corner ( allow yourself a 1/2 “ seam allowance), continue sewing all around pillow edges until you reach past 2 inches at the opposite corner. Sew you pillow closed either by hand utilizing your repair kit needles or by machine. Cut a piece of cardboard to 8″x10″. Cut the dacron to match the cardboard (8″x10″). Using adhesive spray, glue the dacron onto the cardboard. Cut the fabric to 9″x11″ and glue it onto the dacron. Measure enough gimp to go diagonally across your board with an extra 1/2″ in each corner. Glue ends of gimp to back and where it intersects. Put a tack where the gimp pieces intersect and press it into the board. Cut 4 more pieces of gimp and space them 3″ from the center and repeat steps 6 and 7. Draw a rectangle that is 3 – 4 inches long and 1 inch wide on top of your shoebox in the center. Using hot glue, cover the inside and outside of the box with the fabric. Don’t forget to cut out the hole of the fabric. Decorate the fabric covered box with appliquè and trim using hot glue. 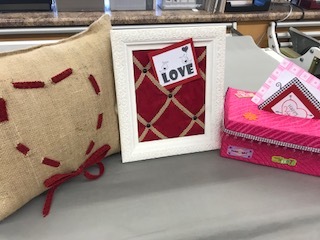 At Fabric Depot & Supply, we have everything you need to make these cute Valentine’s Day crafts. We also have experts who can help you find everything and get you the correct measurements you need.